Check out this modern artistic wall mirror for any contemporary themed interiors, this one is unique. This mirror is rectangular shape and has thick borders. 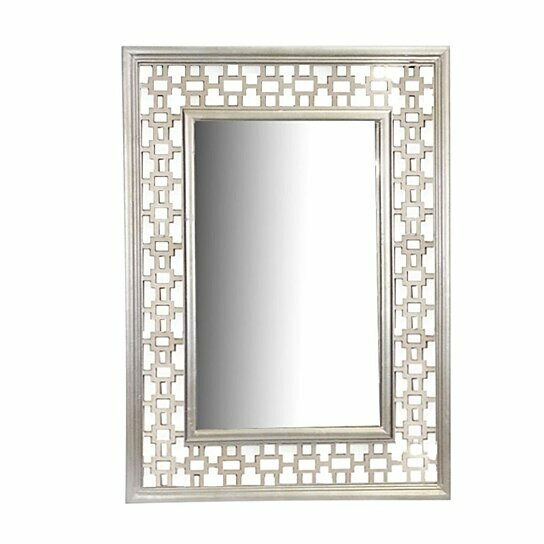 The wooden cutwork on the frame offers this mirror distinctive look. In shade of silver is perfect for range of home interior. Silver color decor compliments any color interior with ease. Adorn it in the drawing room for decoration purpose or in the lavatory. This mirror is easy to clean and maintain. This designer mirror can be part of any interior be it home, restaurant or cafe interior. This mirror is easy to mount and relocate. As it?s wooden, it is sturdy and will last for years to come.